Tim Cook and Prince Mohammed strolling through Apple Park. 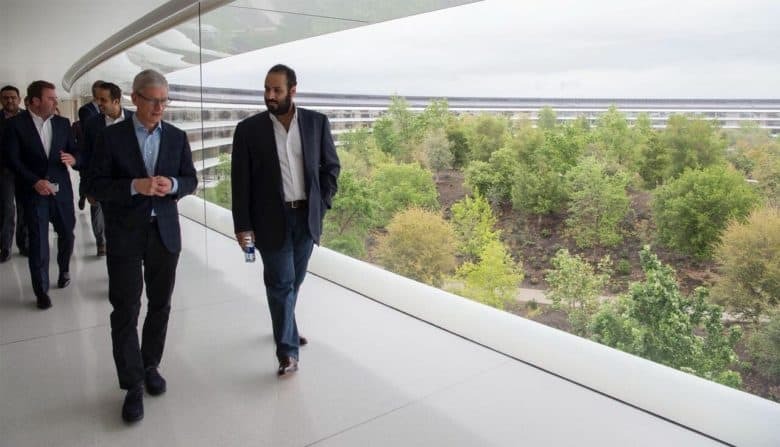 Saudi Crown Prince Mohammed bin Salman visited Apple’s new headquarters in California as part of his tour across the western U.S., during which he aims to change the country’s perspective on Saudi Arabia. Apple CEO Tim Cook was on hand for Salman’s tour of the newly completed Apple Park. The prince even got a special presentation inside Steve Jobs Theatre that focused on Apple’s modern voice applications. During his visit with Apple execs, Salman discussed developing apps in Saudi Arabia as well as creating new educational content in the Arabic language. They also discussed job opportunities that would allow Saudi youth to get training at Apple HQ. Salman said he wants to shift Saudi Arabia from a country that invests extensively in oil and fossil fuels to one that innovates in markets like technology and renewable energy.